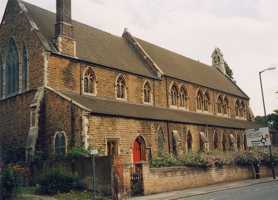 St Catharine’s Church, Nottingham is located on the edge of the city centre, only a few minutes walk from the Market Square, and major shopping areas. Now surrounded by a bingo hall, a car park, a former burial ground and three buildings used for religious worship, it stands as a symbol of a former era. Starting with a simple Mortuary Chapel in 1883, the site has accommodated an iron Mission Chapel, a church institute, a church hall and finally the present church building. Generally the church interior is based on 13th century style, with sedilia and picina set into the south wall of the chancel. The nave has four arches supporting a high clerestory above and a wood arched roof. A central aisle gives clear progression the length of the church. Side aisles each terminated by chapels make it an open spacious building for a congregation of 600. Part of the west end of the church is partitioned to create a smaller area of worship for the reduced number of users. Sadly the church closed its doors as a Church of England building on Easter Sunday, 20th April 2003.